Sharing this great first post by Angelos Bollas – @angelos_bollas on Twitter, where he has already created an account and is becoming an active and engaged user !!!! I shall only post a few lines here and encourage you to visit his new blog, leave a comment and connect with him on Twitter and Facebook. 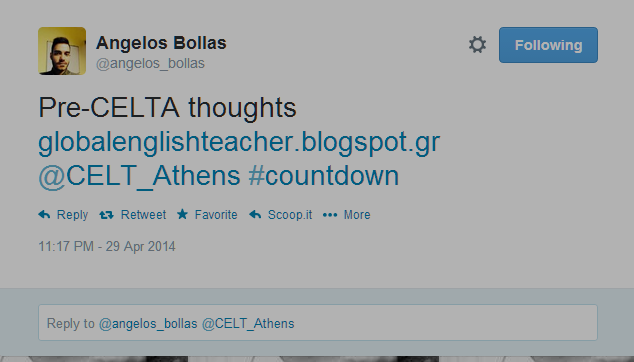 My name is Angelos Bollas and I am about to start a CELTA course at CELT International Teacher Development Centre. Even though I have been working for 8 years as an on and offline English Language Teacher in Greece and the UK, I realised that I was in need of formal teacher training. Not only have I faced difficulties in my job all these years, but also I have just come up with a very serious issue: when I decided to start a blog about language education, I had nothing to write about. or so I thought. For the last two weeks, I have been preparing for my CELTA course. Other than grammar revisions and clarifications, I have started studying books and journals on methodology, classroom management, teacher development, and so many other issues the names of which I did not know even though I was “using” some of them.